Freiraum deals with the concept of freedom, which has been of fundamental relevance to European cultural history and European self-understanding ever since the Enlightenment. Why do we speak about function(s) and the role(s) of libraries so much these days? Why are we afraid of losing this space? Voices of Memory. A Riverside Sound Art Installation at the Irish National War Memorial Gardens by Christina Kubisch is a contemporary remembrance of the more than 49,000 Irish people who died in the First World War. A joint project of several Goethe-Instituts bringing together comic artists and illustrators dealing with topics like immigration, stereotypes and prejudices, about foreignness. 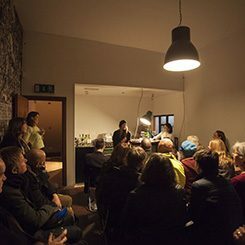 Germany@Home is a series of literary evenings featuring German (and sometimes Irish) writers that will take place in the comfort of a real home. There are many places to be found in Ireland with connections to German people and stories. Discover them in „German traces in Ireland“. Europoly will take a closer look at European realities – in theatre, in film, on our website – on how the crisis has affected people, cultures, cities and everyday lives. Why should Irish people learn German? German Connects :), an initiative of the German Embassy and the Goethe-Institut Irland, has the answers! Fading memories is devoting a year of international events to the themes of privacy and data ownership in the digital age against the backdrop of developments in the countries of north-western Europe.